Yesterday, as my ten-year-old came home from school, I watched him scamper past the front door and around to the carport. He knew our van was in the shop, and that meant there would be a different car in the driveway. And he, unlike my big guy, shares his dad's mostly unrequited love of cars. A new car, a different car, well, that's something. "DAA-AAAD! You got a COBALT? A COBALT?" Which I did. 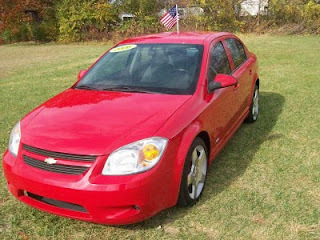 A two-thousand-and-whatever Chevy Cobalt LT, as bland and nondescript a vehicle as can be imagined, the archetypal rental car. It was red, which is just about the only thing even vaguely interesting about it. It was permeated with that rental car smell, which I think comes from having someone apply a milliliter of cigarette-and-stress-sweat infusion to the carpets every other week. The fabric of the seats was rough and ugly, the plastic hard and cheap and ill-fitting. My boys, used now to the technological doodaddery of our Prius and the La-Z-Boy comforts of our aging but functional minivan, both observed this lowliest of cars with complete disdain. It's a sad little car. But I have a long memory, my memory of cars goes easily back to when I was ten. 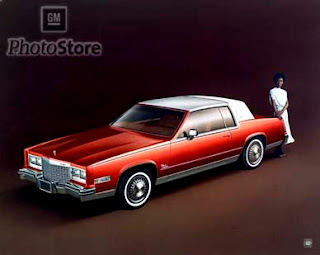 Back in the halycon days of 1979, if you were the mack daddy, the J.R. Ewing oozing petrodollars across eight lanes of Texas oilscape blacktop, you'd be rolling up to the pah-tay in a shiny new red Cadillac El Dorado Biarritz. It'd have set you back $16 grand, and those were 1979 dollars. So...let's look at these two cars side by side. Both are red. Both likely smell like tobacco smoke. The Caddy puts 170 horse to the ground, as opposed to the 125-ish of the Cobalt, but performance is essentially the same given the Caddy's considerable mass. The El Dorado is quieter, but the Cobalt handles better, and has more interior room. Both have the full suite of 1979 luxury must haves. Dimming internal lights. Power windows/locks/mirrors. The Caddy has better seats, great pillowy things. The Cobalt comes right back with four convenient cupholders, of which the Caddy has exactly none. The El Dorado is arguably better looking, although much less sleek. But then the Cobalt has a sound system that blows the Caddy's eight-track out of the water. By pretty much every 1979 standard, the Cobalt is a luxury car. Yeah, a bit noisy and not terribly well put together...but back in the late 70's, the only thing Americans could successfully put together was our feathered back hair. Ten year old me would have been impressed. We are strangely oblivious to how much we have. Our culture serves up a cornucopia of riches, surrounding us with luxuries that would be mindblowing a generation ago, and the realm of science fiction the generation before that. Even our humblest things would have been the reserve of the wealthy and the spoiled and the elite. And yet we are never satisfied, never happy. Am I alone in feeling this isn't a good thing?